Cruella de ville. A portrait of cruella de ville from disney's 101 dalmations.. Wallpaper and background images in the Classic Disney club tagged: classic disney animated film 101 dalmations cruella de ville image. This Classic Disney photo might contain anime, comic book, manga, cartoon, portrait, headshot, and closeup. That's amazingly wicked. 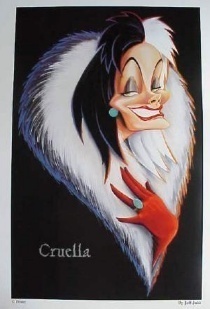 One of the best Disney Villans ever.